Budehaven Community School » PE Department Provide 6th Form with extra opportunities. 6th Form Students visit Cardiff Metropolitan University & also carry out Emergency First Aid at Work Qualification. 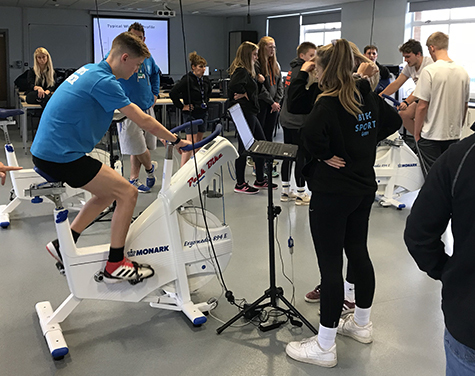 Last Wednesday we took 23 A level PE, BTEC Sport & BTEC Sport & Exercise Science students to Cardiff Met University for an inspiration visit and to experience life as a University Student. After an early 7am leave and very quiet students on the two mini buses, we arrived at Cardiff Met and were immediately in our first seminar; Performance Analysis. The was amazing. 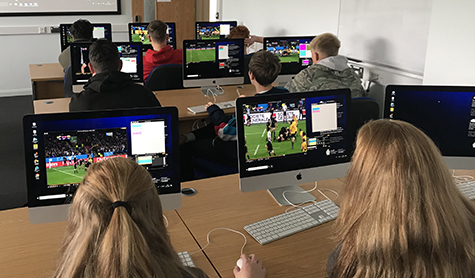 Each student sat behind their own Mac Computer and learnt how to use the performance analysis software in order to analyse an International Rugby game. We all felt like we were on match of the day! This was a great hands on experience of what it is like to study a 3 year degree in sports analysing. We then went straight into an Anatomy & Physiology seminar. Again, this was an interactive lesson and suited our competitive students, as they spent the hour revising the bones and muscles in the human body through various activities with the winners being our Sports Science girl group! Kyle Garvie and Emily Fanson, two ex Budehaven (A Level PE) students met us and took us to the cafeteria for lunch. It was great to catch up with both of them and hear how they are getting on. We really appreciated the inside knowledge on the University and the tours they gave us. After lunch, we went into a Physiology Lab Practical where the students learnt about the ATP-PC system and how this is used in the anaerobic energy system. A few of them had completed a PARQ and carried out the Wingate Fitness Test (a 30 second test of anaerobic leg strength). This was incredible as we were able to use modern technology to analyse the results. 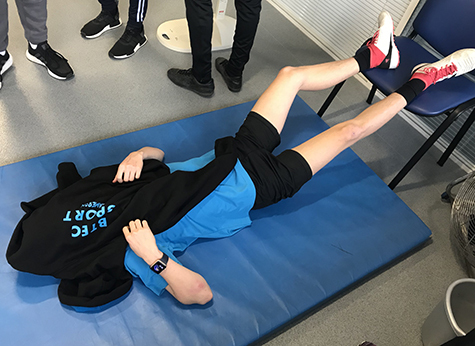 The students did extremely well although Cameron Miles (BTEC Sport) did have to spend 30 minutes lying down with his legs in the air to recover! Mr Drew was advised not to do it considering we had just had lunch, the buckets were strategically placed around the room for the others! The day ended by touring all of facilities and watching different BUCS fixtures. We saw football, hockey, rugbym, netball, badminton, tennis and even had a go ourselves in the gymnasium with sprung floor, much to everyones amusement! We really were blown away by what the university has to offer and as a result many students have been inspired to apply and/or consider for their UCAS application. Henry Lumley immediately put his UCAS application in and has received an offer already of DDM to study Sports Rehabilitation. Thank you to Claire Gifford, Rob Francis and Mr P Drew for supporting and attending this trip. I aim to run one every year, so watch this space where we will go next year! 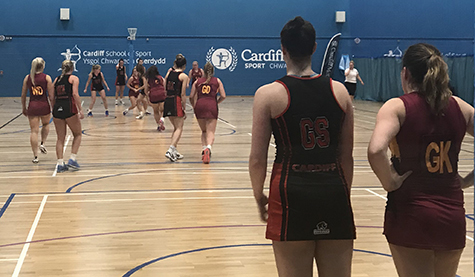 Cardiff Met will happen again in 2020. 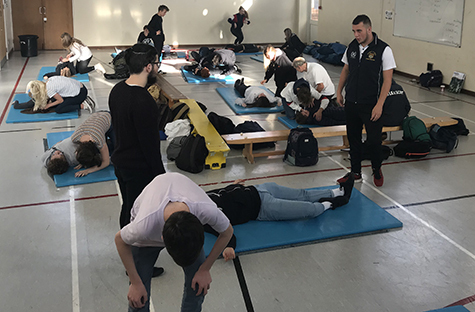 Back at school this week, 30 students, consisting of Level 3 Sports Leaders and A level PE students who are using coaching as their coursework, carried out an Emergency First Aid at Work Qualification. All students were successful and will now receive a certificate valid for three years. The provider also included an extra course called Save A Life child which demonstrated Child CPR as well as the use of an AED ( Automated External Defibrillator). 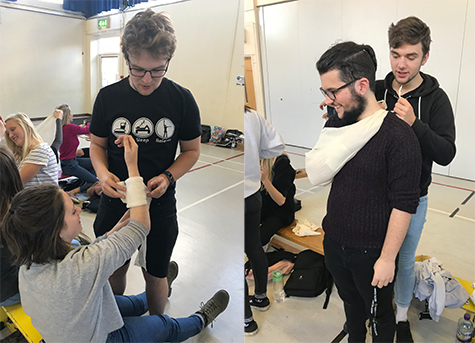 First aid is an invaluable skill to have and I will ensure that I run this course every year for our 6th Form students. Thank you to Triangle Training, Peter Juniper for being an excellent provider.